“I’ve loved you the way my Father has loved me. Make yourselves at home in my love. If you keep my commands, you’ll remain intimately at home in my love. kept my Father’s commands and made myself at home in His love. 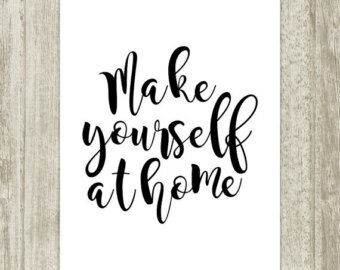 When we are at home, we behave differently than we do when we are out. Make-up is off, hair is up in a messy bun, the most comfortable pajamas or sweats are on. No pretense, no need to pretend, no need to be anything but comfortable. Safe and secure. Happy and content. That’s how Jesus means for us to feel in His presence: at home! Wherever you are right now, take a quick break from responsibilities and worries of life, let Jesus be your home. Rest in His love. You are His greatest treasure, dear child of God. Because Jesus is always with us, we can always have this feeling of contentment and security in His love. Please understand that your circumstances do not have to alter your emotions. There have been moments or days or even long seasons in my life where times were hard – but the presence of Christ, if I turned to Him, was able to bring peace and security. Find time every day to be at home with the Lord, rest in His love. The more time you spend with Him, the more peace and contentment you will experience. The more time you spend with Him, the less you will be affected emotionally by your circumstances. praying you find contentment in His love, and make yourself at home with Jesus today!